Save up to $7,500 on select Garmin Avionics NOW through December 15th, 2015! Garmin’s popular ‘Stack up the Savings Rebate’ is back for the first time in over 3 years, for a limited time! Now is the best time to save! Whether equipping with a complete glass cockpit upgrade, replacing a broken audio panel, adding ADS-B and more, this rebate allows customers to take advantage of Garmin’s most popular avionics, including the G600/G500 flight display and GTN 750/650 touchscreen navigator. Jet Center Medford is an authorized Garmin avionics dealer, and specially trained to install Garmin products. Call (800) 359-0297 today and we will take care of all ordering, forms and installation for you. 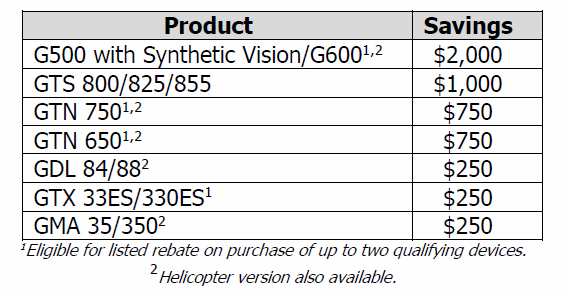 The Stack up the Savings rebate begins on October 15th, 2015 and ends December 15th, 2015 and can be combined with the $200 savings coupon from the ADS-B installation planner as well as the GTN 750/650 GTX 330 ES/GTX 33 ES bundles. Please contact Jet Center MFR with any promotional questions.